If you drive in a lot of traffic, it might not surprise you to learn that not everyone who has a driver's license knows how to drive. Researchers at The Children's Hospital of Philadelphia's (CHOP) Center for Injury Research and Prevention and the University of Pennsylvania say they have proven this pretty convincingly. They set up what they call the Simulated Driving Assessment (SDA), a driving simulator much like the ones pilots use for flight training. To program the simulator, the researchers analyzed five years of data from car accidents involving young and newly-licensed drivers. They created a number of traffic scenarios that often lead to crashes. Next, they recruited some newly licensed drivers, along with older people who had been driving much longer, and put them through the traffic simulation. During the 35-minute simulation, which incorporates 22 variations of the most common ways teen drivers crash, nearly 43% of teen drivers who had their licenses three months or less recorded at least one crash in the simulator. Adult drivers were far from perfect but did better, crashing once at least 29% of the time. For every additional driving error during the SDA, the risk for crashing or running off the road increased by 8%. The results showed the new drivers did fine with basic stuff, like using turn signals. Where they literally ran off the road was in the more advanced driving skills, like braking in hazardous situations. Winston said some drivers haven't developed the skills they need to navigate complex driving situations and when they make mistakes, they are more likely to crash. “It's no longer a mystery - we know where and how teens crash,” she said. “Now we are able to 'diagnose driving' in order to ensure that we are training and putting skilled drivers on the road." This research project builds on previous studies that indicate many newly licensed teenage drivers get through their learning period with a significant deficit in driving skills. Once they get on the road unfettered, they run a higher risk of making risky left turns, rear-ending the vehicle in front or running off the road. 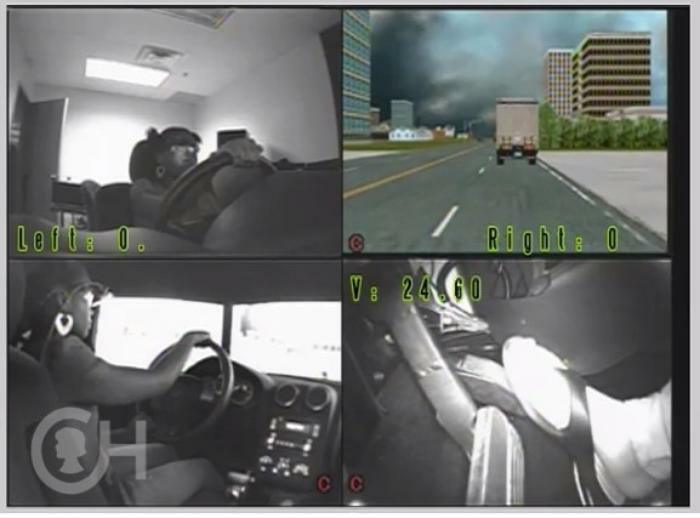 Catherine McDonald, lead author of the study and a teen driver safety researcher at the University of Pennsylvania School of Nursing, says a challenging simulated driving test, where no one actually gets hurt when a new driver crashes, should be considered as part of basic new driver training. “If we can identify driving skill deficits in a safe, simulated environment, then we can tell families and driving instructors what to focus on during supervised practice drives or how to help those with citations or crashes who are already licensed," McDonald said. She says we should all be worried that the participants in the simulator study were all licensed drivers, yet many had inadequate driving skills. Lay on other common driving distractions like cell phones and other passengers and the odds of an accident go up.